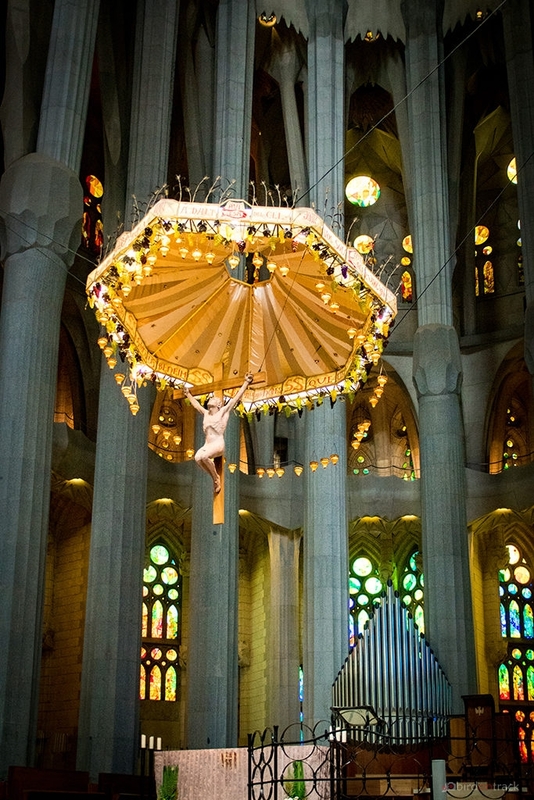 Sagrada Familia Barcelona Tips ⇒ Everything for your next visit! What is the most famous landmark of Barcelona? Well, maybe the question is too brief and should be: What is a landmark of Spain or even Europe? 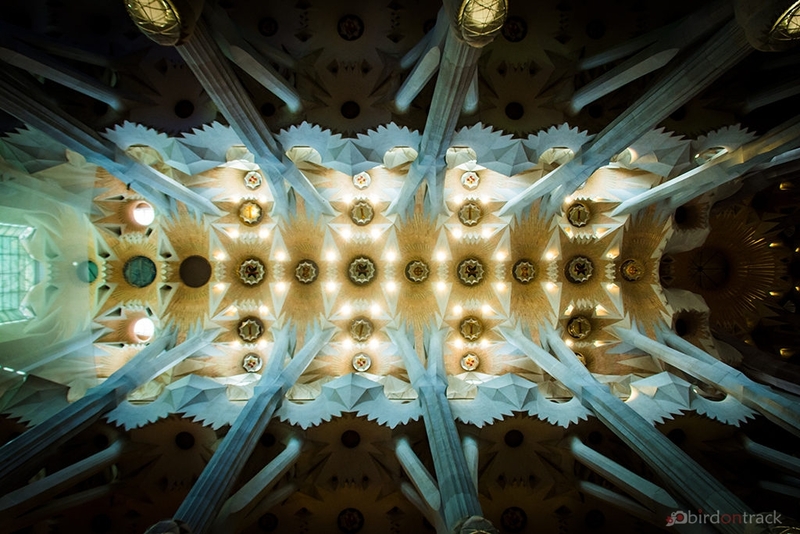 Although opinions may differ, there is no doubt that the Sagrada Familia, which is our today’s article about, is an absolutely monumental building, unique in history and architecture. That’s why we have a lot of Sagrada Familia Barcelona tips for you in store here today. Almost everyone has probably heard of this Roman Catholic basilica, which translates into English as the “Atonement Temple of the Holy Family“. Yes, it is about this superlative and so far unfinished church designed by Antoni Gaudì. Located in the northern part of Barcelona, it occupies a complete block of streets in the Eixample district. 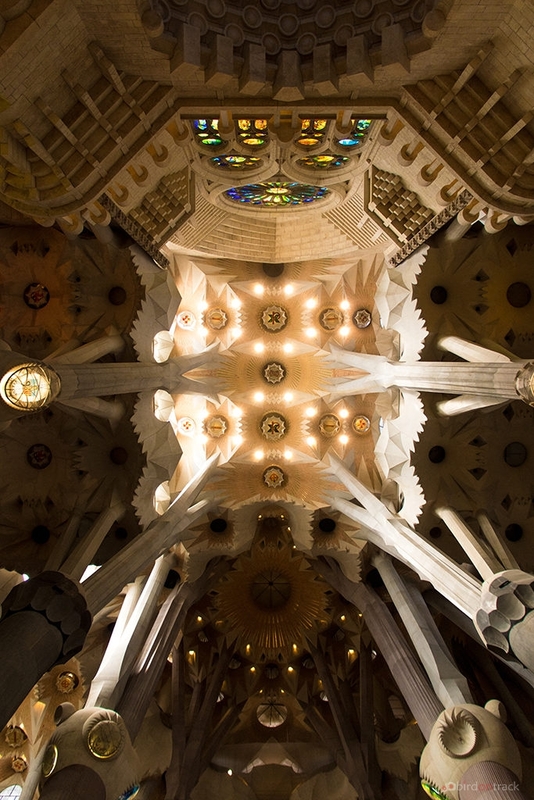 How was the Sagrada Familia Gaudi Barcelona built? It was the chairman of the Holy Brotherhood Josè Maria Bocabella, who decided in the mid-19th century to build a new church in Barcelona. Originally, he wanted to build the planned church even closer to the city center, but the already very high land prices were the problem here. Incidentally, it was not Gaudi at the very beginning who gave the church its appearance. His role began later. A man called Francisco del Villar planned the building in the Gothic style. Due to dislocations, however, with Bocabella, he broke off early on his commitment. This was the hour of the still young Antoni Gaudi, who was officially commissioned to build the Sagrada Familia. Until his death in 1926, he worked to complete his life’s work. It soon was clear that this church dwarfed almost everything that had previously happened. Gaudi’s genius is reflected in every detail. 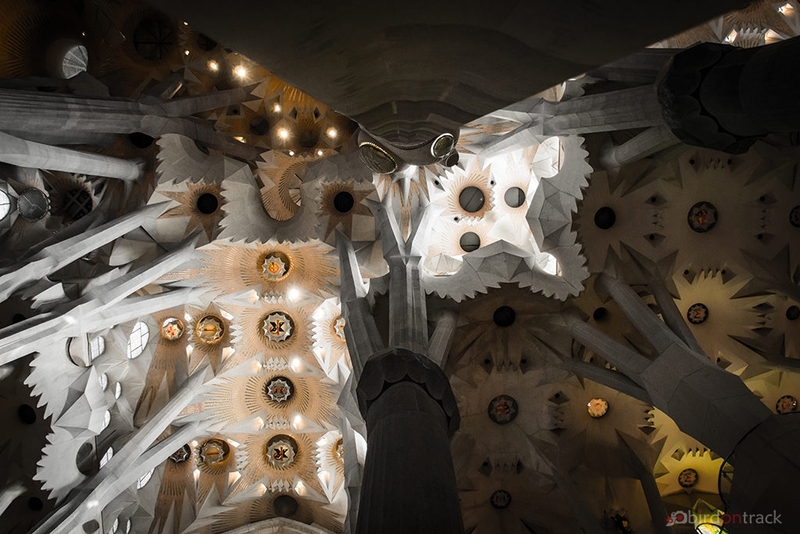 According to his ideas even the areas that Gaudi did not plan to complete should give the successors the opportunity to incorporate their own handwriting into the final design of the church, without changing too much the soul of the building. The defining element in all is a deep spirituality. Due to its fundamental importance, the church was finally raised to a basilica in November 2010 by the pope Benedict XVI. 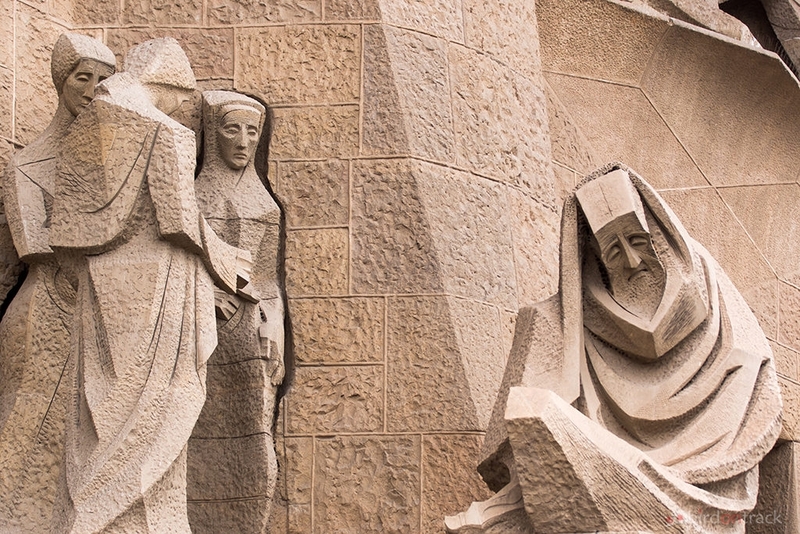 Significantly, the Sagrada Familia Barcelona is full of details. Just the sheer size makes the various facades stand out with their seemingly endless details. As the name suggests, this north-eastern façade thematizes and visualizes the birth of Christ. The number 3 plays a big role here. Three Portals, Three Virtues (Faith, Hope, Love). 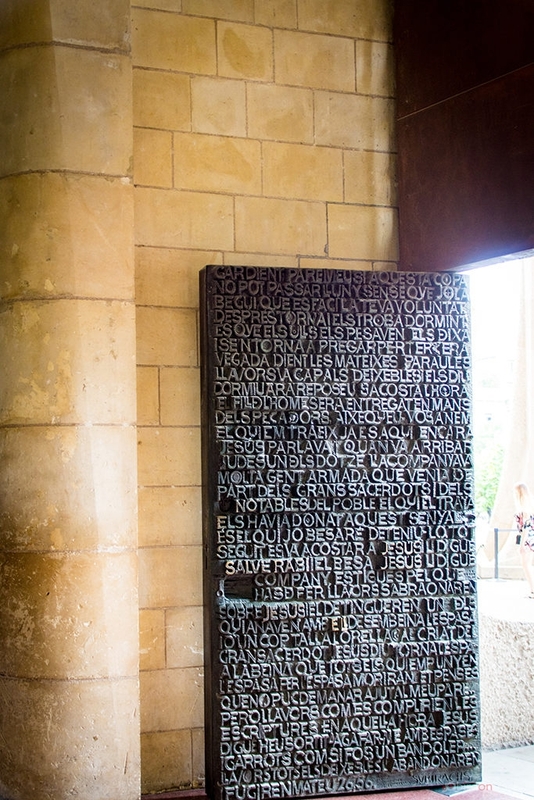 The Mercy Portal is a visual highlight with its seven-meter-high gates, four in total. Here, for example, Etsuro Sotoo, a sculptor from Japan made himself immortal. Numerous plants such as pumpkins, lilies and ivy, as well as insects of all stripes have been worked out here from the rock in sometimes the smallest scales. Following the birth of the Passion, the Passion facade now visualizes the Passion of Christ. Aligned to the south-west, it impresses completely differently than the birth facade with its clarity and simplicity. In 1986, the Catalan sculptor Josep Maria Subirachs realized the design. In particular, the kiss, the flagellation and the crucifixion of Jesus are shown here. 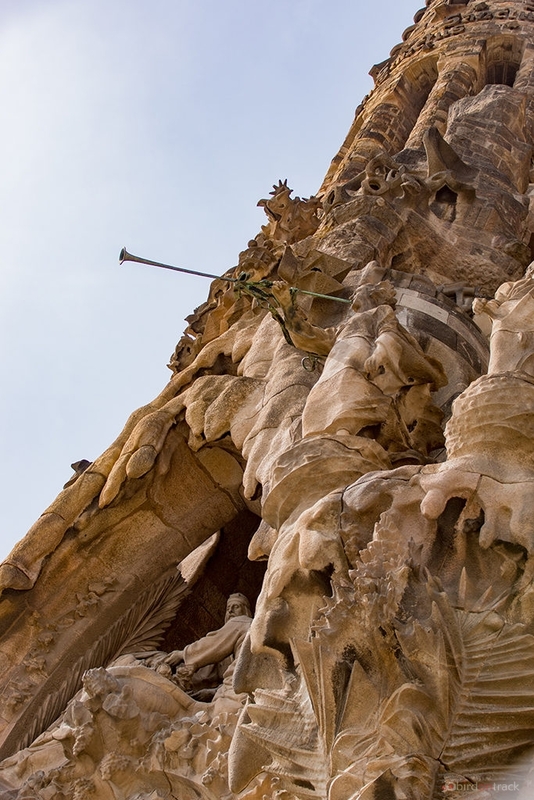 The Passion facade was only begun after Gaudi’s death and is still unfinished to this day. Also under construction is the south-facing Gloria façade. Powerful 21 columns and 2 chapels make up the highlight here. A church that is set to set new standards in almost everything, of course, can score especially with its towers. So is the Sagrada de Familia. By 2026 at the latest after finalization, it should have a total of 18 towers. Four of them will be devoted to evangelists, two more to Mary and Jesus Christ. This will also be the highest tower and with just 172 meters also the highest church tower in the world. It is interesting that the towers will not be higher than the mountains around Barcelona. This would increase too much the work of man against God. Incidentally, the towers are also accessible from the inside. Narrow, very steep spiral staircases lead upwards. 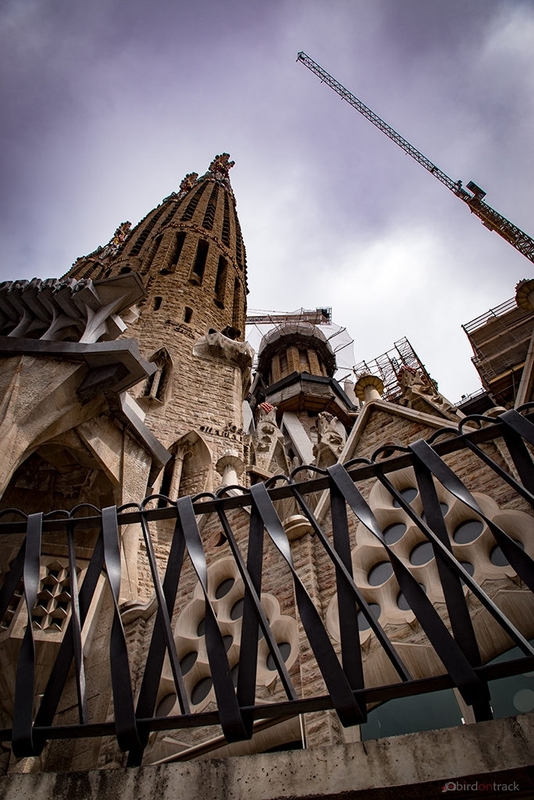 Only one tower, the St. Barnabas tower on the birth facade was completed during Gaudi’s lifetime. As soon as you get fed up with the spectacular exterior facade no less imposing is the inside of the Sagrada Familia Barcelona. Likewise, everything here is subject to strict logic and incredible symbolism and meaning. The first thing you notice is the enormous height, the huge columns and this intense, strong and colorful light. Nave and transepts have a height of 45 meters, the aisles 30 meters. The apse itself, which houses the altar, has a height of unbelievable 60 meters. Likewise, it is directly above the Holy Crypt, the burial vault. Angel faces and tears in the heart of the apse symbolize the suffering of Jesus. There is room for more than 1,500 singers in the respective naves. Another stroke of genius Gaudi was the calculation and design of the supporting pillars and vaults. Gaudi developed a method to create knots with ropes and to create pressure points with weights. These models allowed accurate conclusions about the statics. 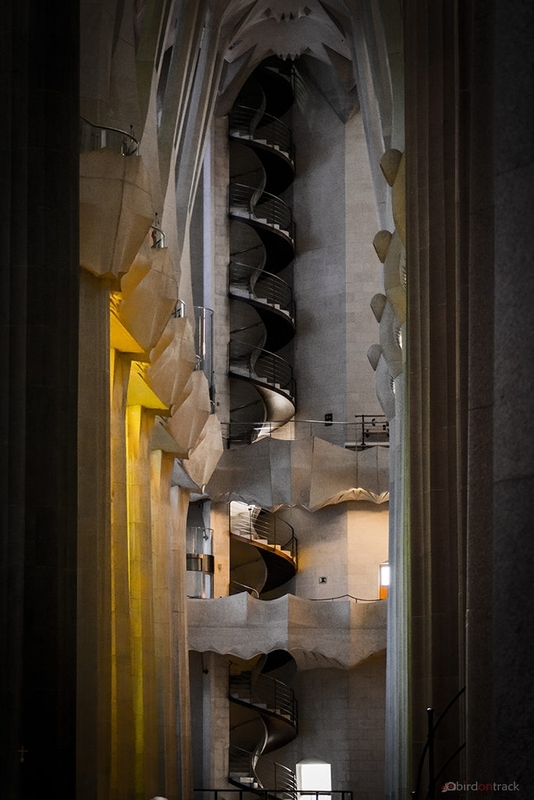 As a result, Gaudi was able to build the columns slightly inclined and thus to simulate a huge forest. Apart from the fact that the artistic elaboration is breathtaking and beautiful, Gaudi was the only one who succeeded in creating such a system, so close to nature, through this method developed by him. Last but not least we want to take a closer look at the crypt. Gaudi himself had no great influence on the design of it, as he took over the site management for this already very late. However, he modified these a little, so that generally more light and air could flow through the crypt. 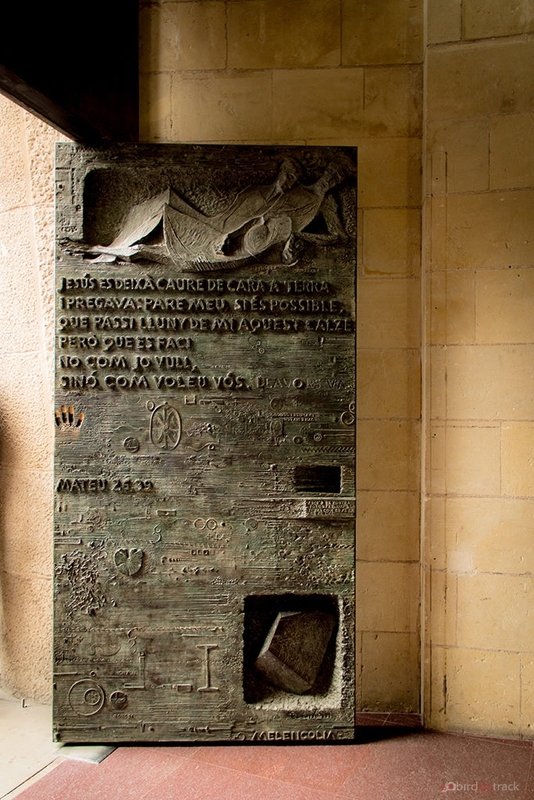 It contains the tombs of Josep Maria Bocabella, the leader of the Holy Brotherhood, who ordered the construction of the Sagrada Familia, and the tomb of Antoni Gaudi himself in the Chapel of the Blessed Virgin of Carmel. The crypt was completed in 1891. Incidentally, the crypts originated from the time of the persecution of Christians. The translation from Greek therefore means hiding-place, since the faithful had to hide themselves in those catacombs, tunnels and subterranean vaults. One thing is important to say. 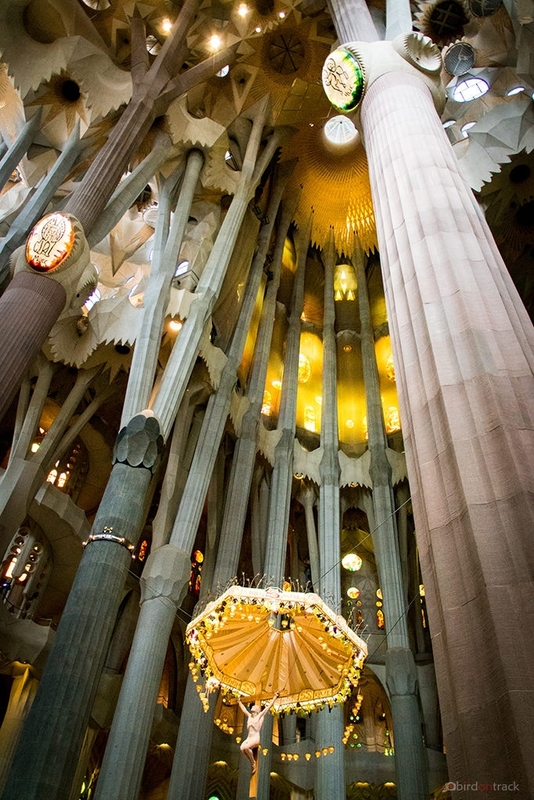 All these explanations give only a small outline of the countless elaborations of the Sagrada Familia Barcelona. It is indeed the case that one must have seen this monumental work with one’s own eyes. This almost divine adaptation of the most beautiful specifications of Mother Nature in so many details and logical expressions makes speechless. All these small and in their content all the bigger miracles, such as the square of numbers on the outer façade, which in all directions gives the sum of 33 (the age of Jesus’ death), make the visit to the Sagrada Familia Barcelona an incomparable event. Again only marginally the incredible beauty is mentioned here. 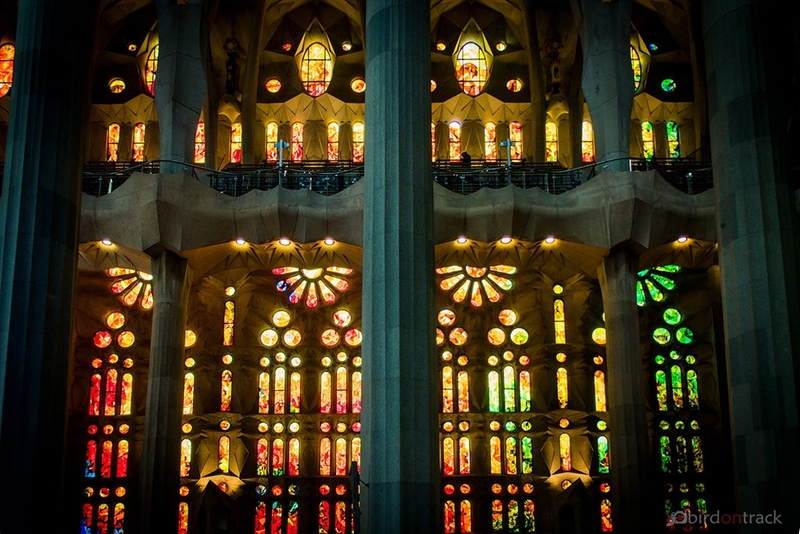 Not least, this spectacular play of colors of the colorful windows, the sheer size, the smallest details such as millimeter-sized insects as stone sculptures. This building is a kind of miracle, from the tiniest stonemasons to its tallest towers. In order to get in as quickly as possible, it is best to buy the tickets here before. In addition, there are various options including a visit to the tower. From about 15 EUR for the preferred inlet is one. Thats it from the Atonement Temple of the Holy Family. Next time we are on a discovery tour on one of the Game of Thrones locations, the beautiful Girona in Spain! Wow, I have never seen Sagrada Familia this way before! When we were there many years ago it was closed for public because of renovation and we couldnt see much. But seeing all your photos and reading stories and facts about this place just open my eyes of how incredible Sagrada Familia really is! Its looks so whimsical outside but inside even more but yet so beautiful! I guess I need to have a look myself when I ever go back to Barcelona! Such a pity to hear that it was closed when you visited Barcelona. I am pretty sure you would have liked it. But who knows, maybe you have the chance to see this outstanding cathedral another time. 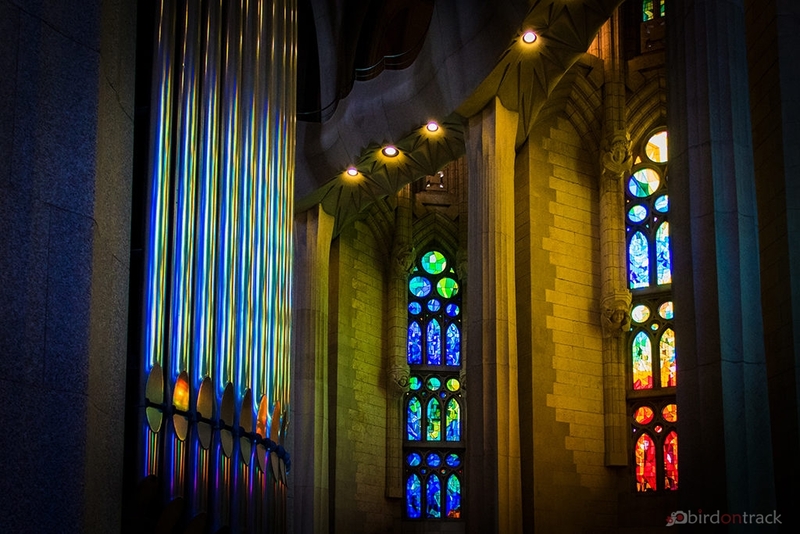 And yes, it is also all those countless details everywhere make the Sagrada so special. La Sagrada Familia is such a mystical building! I must admit that I was disappointed by the interior, which wasn’t worth 15euros in my opinion, but you captured its essence so beautifully that I am now rethinking the whole thing! There is also ann impressive art-nouveau hospital 5 minutes by foot that is worh visiting, called Hospital Sant Pau! It’s been a long time since I visited La Sagrada Familia, and it’s amazing that it’s still not finished! The interior is beautiful, and as a Catholic, I really appreciate this beautiful place of worship. Can’t wait to see the finished work of art. Your photos are just mesmerising! Hi Lisa, Thank you for stopping by. 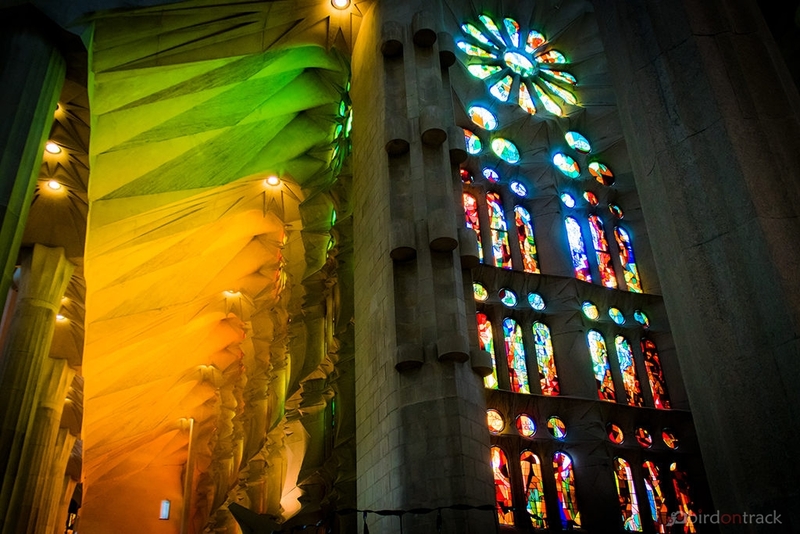 Great t hear that you have seen Sagrada as well already. 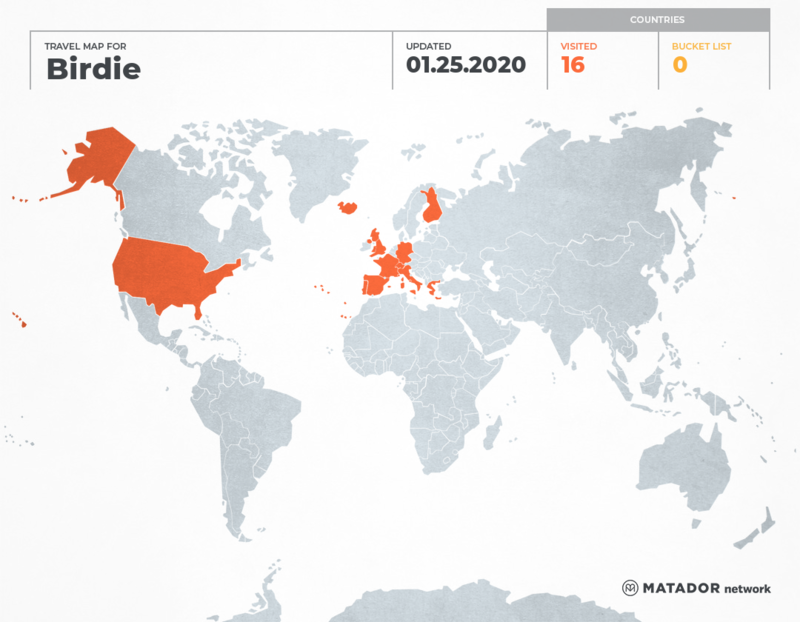 Yes can you imagine, it is planned to finish the construction work in 2026! Really cool, that you like the photos. I tried to catch some of the magic of Sagrada Familia. We have been to Barcelona and the most favorite part of the city for us was exploring the Gaudi architecture. 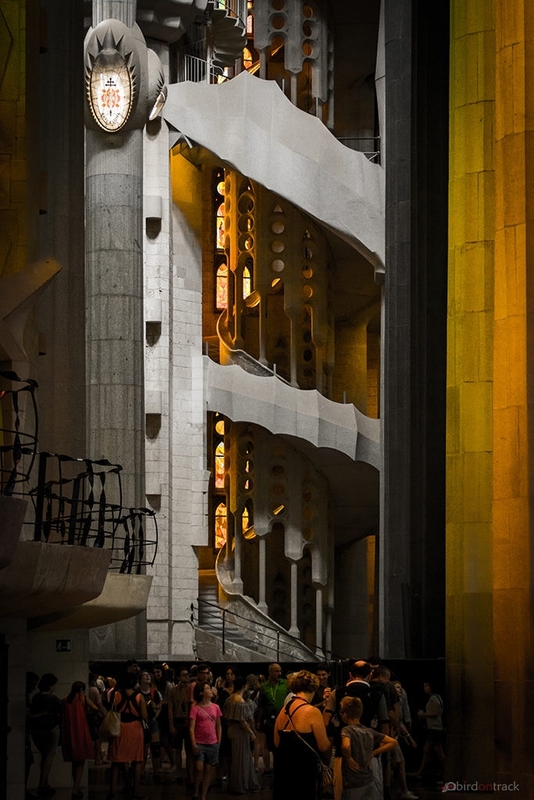 They just seem out of this world and Sagrada Familia is no exception. Every inch of the edifice has some interesting and awe-inspiring design details. Thanks for this detailed information now we know much more about this wonderful manmade creation. I visited Spain twice but didn’t make it to Barcelona. The Sagrada Familia Barcelona looks really impressive as its reputation. Your pictures look really amazing too. I love the colorful window and the trumpet of this place. 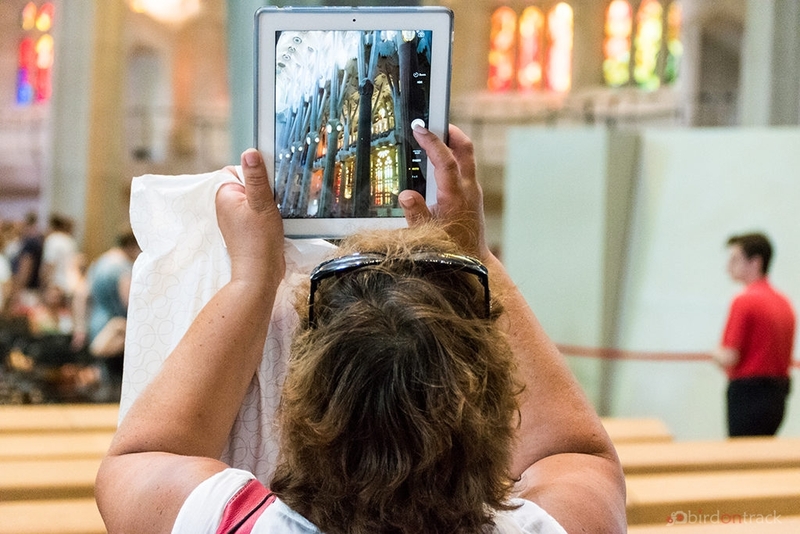 The Sagrada Familia is fantastic and I love your photos. I definitely agree about buying tickets ahead online. It is amazing that the Sagrada Familia isn’t even finished yet. I can’t wait to see the Gloria Facade once it is alldone. Thank you for recommending that the tickets be bought earlier, I would never have thought of that. I haven’t seen this monumental building until now, I haven’t been to Spain at all actually. But of course, the pictures are everywhere and I really want to go someday! Thanks for all the details on the architecture and the interiors, it looks amazing in your pictures. I would definitely love to head down to the Sagrada Familia in Barcelona because of its magnificent architecture and rich historical significance. It is certainly one of the most impressive structures in Spain, and I’d love to visit it soon. Wow! What an extremely fascinating and awe inspiring building Sagrada Familia is! The architecture of the church simply leaves you spell bound. The majestic sculptors, the vibrant colours and the tranquil vibes – everything is amazing about this place. 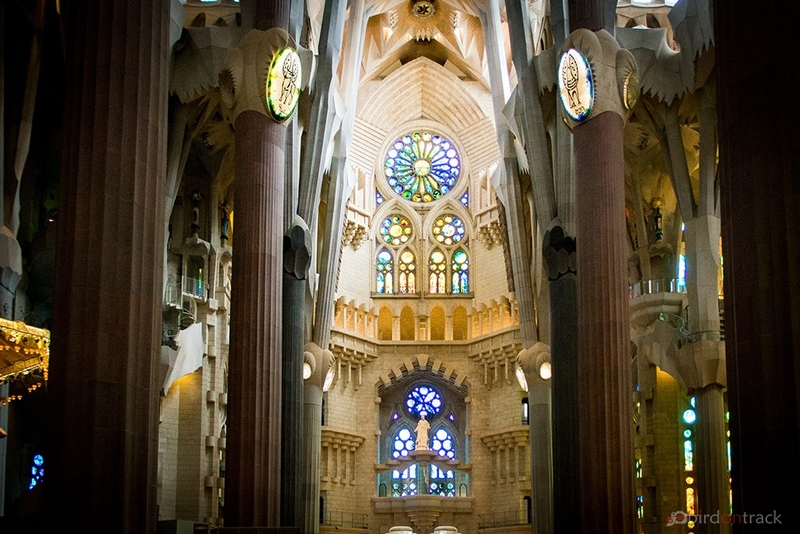 Barcelona is on my bucket list and I would love to explore this beautiful church on my visit. Thanks for sharing this beautiful post and the lovely photographs.